We all know Roger Federer, Rafael Nadal, Serena Williams and other top runners on ATP as well as WTA rankings. But what about superstars on mobile forms of Tennis ? Bring the ultimate Tennis experience in Android and enjoy the game anywhere any time even on the go. One of the finest choices for hard-core Tennis fans. Choose your player mode, compete against 50 players in 18 real life venues. It let you play on clay, grass, hard or indoor courts and both in single as well as double challenges. Stick Tennis offers faster, smoother Tennis play on your mobile and tablets. Play against world class players, collect trophies, unlock wide range of players and realistic court surfaces. It contains lovely game play and beautiful graphics which are enough to make you addictive. Another popular Tennis game. The play is based on realistic 3D physics and let you play both in quick play and world tour modes. Brilliant game extremely fun to play but hard to master. Smash Tennis will make you a smart player across different courts of Tennis. Awesome challenges, amazing graphics and outstanding controls make it a perfect game for Android. How do you feel about a Tennis game that effectively combines realistic 3D physics with intuitive controls ? You can represent your country, challenge friends to compete and be the winner of the game. Play Tennis comes next into our list. Use the touchscreen to perform smashes and side shots. 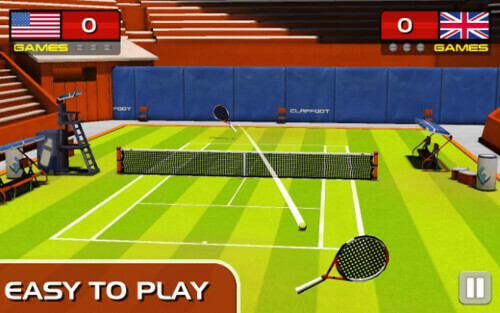 Take out multiple opponents and become the world tennis champion. If we missed your favourite tennis game, let us know through comments.